April 9, 2018 - Prompt payment? Yes, please. March 26, 2018 - "Cost of bidding and risk too high"
As part of a recently launched pilot project, Public Services and Procurement Canada (PSPC) has issued its first request for proposals using qualifications-based selection (QBS) for the procurement of architects and engineers on federal projects. The RAIC, the Association of Consulting Engineering Companies — Canada, and other stakeholders have been lobbying the federal government to implement QBS as a substitute for price-based contracting. Read the article in the Daily Commercial News. The Association of Architects in Private Practice of Quebec (AAPPQ) and Quebec’s association of engineering consulting firms (AFG) are calling on the Government of Quebec to reject a proposal to award contracts for professional services based on the lowest bid. AAPPQ and AFG have each submitted briefs to the government expressing their opposition to clauses in the proposed amendment to the Regulation respecting certain service contracts of public bodies which would, as of September, allow Transports Quebec ((MTMDET) and the Quebec Infrastructure Society (SQI) to award professional architectural and consulting engineering service contracts using formulas that favour the lowest bidder. The Royal Architectural Institute of Canada (RAIC) last month provided input on forthcoming legislation concerning promptness of payment and adjudication on federal construction projects. The legislation would result in a simpler and quicker process for resolving payment disputes between owners and construction contractors. The new process would result in payment disputes being resolved in months rather than years. The RAIC, together with the Association of Consulting Engineering Companies – Canada and Interior Designers of Canada, expressed concerns that the tight timelines of the new process may compromise consultants’ responsibility to accurately and thoroughly review applications for payment and certify the work. Following a lengthy discussion, it was resolved that consultants’ responsibilities could be exercised without challenging the requirement of the new legislation. The three associations also strongly advised that any new legislation must apply to the holder of RP-1 and RP-2 contracts – BrookfieldGlobal Integrated Solutions (BGIS).The exercise would be almost meaningless if these large contracts were excluded, said the three groups. Representatives of the RAIC, the Association of Consulting Engineering Companies – Canada and the Interior Designers of Canada met with independent experts Bruce Reynolds and Sharon Vogel from Singleton Urquhart Reynolds Vogel LLPon March 27 in Ottawa. Reynolds and Vogel have been contracted by Public Services and Procurement Canada to examine payment and dispute resolution practices on federal projects in Canada’s construction industry and to seek input from industry stakeholders across the country. They will prepare recommendations by May 1 to inform the development of legislation that will direct terms of payment and provide for an adjudication process to ensure contractors, trades, and sub-trades working on federal construction contracts get paid in a timely manner. The legislation is also intended to address gridlock created by disputes. The RAIC was represented by Don Ardiel, MRAIC, Director of Practice, Maria Cook, Manager Communications and Advocacy and RAIC volunteers Toon Dreessen, FRAIC, Past President of the Ontario Association of Architects, and Martin Tite, FRAIC. Also present were ACEC President and CEO John Gamble, ACEC volunteer Andrew Lawton and Ester Ritchie of Interior Designers of Canada. The president of Brookfield Global Integrated Solutions (BGIS) say the federal government service provider will work to correct issues related to the quality of procurement calls, the use of unlicensed practitioners, and to review contract language on liability and risk. BGIS President Gordon Hicks hosted a meeting on February 14 to discuss issues raised by the RAIC and the Association of Consulting Engineering Companies-Canada (ACEC). The RAIC and the ACEC initiated the meeting on behalf of their members, and the parties came together, including nine members of the BGIS management team. Former Interim Executive Director Bruce Lorimer, FRAIC, and Don Ardiel, MRAIC, Director of Practice represented the RAIC. President and CEO John Gamble and volunteer Andrew Lawton represented ACEC. BGIS is a real property service provider for the federal department of Public Services and Procurement Canada (PSPC). As the holder of the RP-1 Contracts, BGIS provides ongoing support for most federal, Crown-owned assets and leased space administered by PSPC as well as assets of other government departments. Representatives of BGIS, the RAIC, and ACEC discussed three primary issues. The RAIC and ACEC presented a number of examples of design contract awards going to unlicensed individuals or organizations for projects that, according to provincial legislation, should have been undertaken by a licensed professional. BGIS agreed to review awards made in 2017 and to enhance their protocols for clear identification of licensed professional requirements. BGIS invited the RAIC and ACEC to identify issues with ongoing proposal calls and committed to taking corrective action. The RAIC and ACEC expressed their shared concerns about inappropriate liability limits, intellectual property transfer, insurance limits and right to set-off in BGIS contracts. BGIS officials said that such conditions are stipulated by Public Services Procurement Canada (PSPC), rather than BGIS and that BGIS itself is subject to the same conditions. In other words, BGIS’ contract with PSPC requires them to carry the same language in their sub-contracts as they have in their prime contract with PSPC. BGIS committed to reviewing the contract language with PSPC. The RAIC and ACEC offered to assist in the discussions between BGIS and PSPC. The RAIC and ACEC reported that insufficient quality and incomplete proposal call documents issued by BGIS result in excessive cost and time in preparing proposal submissions. At worst, consultants could not determine the scope of work, services required, or what consulting discipline was being sought. BGIS committed to an internal review to improve the quality and completeness of their documents. BGIS will meet in April with the RAIC and ACEC to review the steps taken in response to the issues raised and to discuss an approach to PSPC on the concerns about liability limits and risk. "Cost of bidding and risk too high"
Peter Inglis, of Cullinan Studio in London, England, sent a letter to the V&A Museum explaining why the firm will not bid for its new facility. The flaws in the how the V&A is appointing architects is part of a growing trend in public procurement, says Inglis. He has shared the letter with the RAIC. The industry consultation on Qualifications-Based Selection (QBS) for the procurement of architects and engineers by Public Services and Procurement Canada (PSPC) closes on Tuesday, March 13. The Royal Architectural Institute of Canada and the Association of Consulting Engineering Companies – Canada (ACEC) will be responding directly, but it is critical that PSPC also receive responses directly from architectural and consulting engineering firms. A strong supportive message from our membership and industry partners is critical to a successful QBS pilot and subsequent adoption by PSPC. 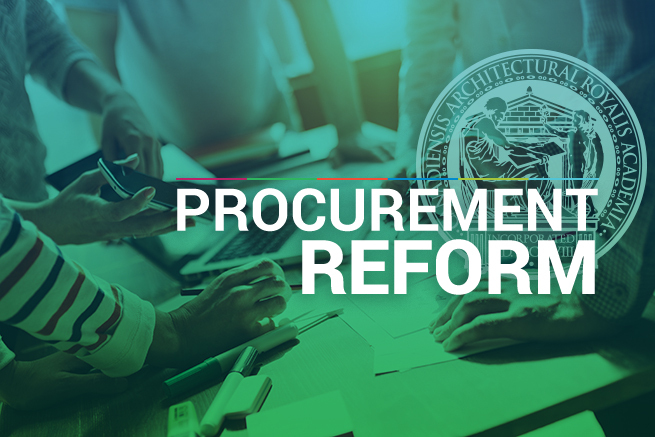 This consultation offers our industry an important and unprecedented opportunity to encourage the public sector to respect and leverage the value provided by architectural firms and to abandon low-cost bidding for architectural services. Use the RAIC/ACEC response as you see fit. However, personalizing these responses in your own words and reflecting your experience. Questions on QBS and Social Procurement may be viewed as two separate consultations (i.e., the decision whether to proceed with the QBS pilot is NOT dependent upon the responses to Social Procurement questions). The RAIC and the Association of Consulting Engineering Companies-Canada (ACEC) met recently with senior management of Brookfield Global Integrated Solutions (BGIS) to discuss concerns with the firm’s procurement and contracting practices. BGIS is a real property service provider for the federal Department of Public Services and Procurement (PSPC). As the holder of the RP-1 Contracts, BGIS provides ongoing support for most federal, Crown-owned assets and leased space administered by PSPC as well as assets of other government departments. Nine members of the BGIS management team attended the February 14 meeting in Ottawa. Interim Executive Director Bruce Lorimer, FRAIC, and Don Ardiel, MRAIC, RAIC Director of Practice represented the RAIC. On behalf of ACEC, President and CEO John Gamble and volunteer Andrew Lawton were also in attendance. Incomplete procurement documents which lead to coordination problems during design and construction with commensurate additional costs. The discussions are expected to continue. The Royal Architectural Institute of Canada (RAIC), the Association of Consulting Engineering Companies Canada (ACEC) and the Interiors Designers of Canada (IDC) are moving ahead on negotiations with the federal government to change the 90%-10% imbalance in assessing consultants’ RFP responses. Public Services and Procurement Canada (PSPC) has begun the consultation process for its long-awaited plans for the Qualifications-Based Selection pilot project. The Standing Committee on Government Operations and Estimates was treated to an impassioned presentation from ACEC’s President and CEO John Gamble in support of Qualifications-Based Selection. And we started the week on a high note, celebrating the commitment of Ottawa architect Deborah Farrow, FRAIC, as she stepped down from her long-standing volunteer commitment as the RAIC’s representative on several government-industry committees. In 2015, the Canadian Construction Association (CCA) held 12 workshops across the country to discuss the quality of design documents, with a focus on federal government projects. In 2017 the CCA’s Quality of Documents Working Group, of which I was a member, issued a final report. Insufficient fees were cited as one cause of possibly inadequate drawings. Of concern was the current method employed in evaluating the fee component of a consultant’s proposal for federal projects. The method used values disproportionately to the lowest fee. Recognizing that the design and construction industry see this as a major problem, PSPC has initiated a task group comprised of federal representatives and members of the design consulting industry including Bruce Lorimer, FRAIC, RAIC’s Interim Executive Director. The objective is to improve the method of evaluation to support the best value to Canada, rather than the lowest fee. Their second meeting will take place the week of February 26. This is how John Gamble, President, and CEO of the Association of Consulting Engineering Companies-Canada (ACEC), began his testimony to the House of Commons Standing Committee on Government Operations and Estimating in Ottawa on February 6. Mr. Gamble presented a strong, articulate, and passionate argument for the adoption of Qualification Based Selection (QBS) in hiring architects and engineers. Public Services and Procurement Canada (PSPC) plans a trial use of Qualifications-Based-Selection (QBS) for procuring architectural and engineering services and has issued a Request-for-Information seeking feedback on QBS from the industry. The RAIC strongly encourages members to respond to the questionnaire by the March 13 deadline. “The RAIC and its members have long been concerned about the undue influence of fees on selection processes,” says RAIC President Michael Cox, FRAIC. “We see this RFI as an excellent initiative to explore a consultant-selection method that will respect the experience and approach that architects will bring to a project and allow them a fee base to provide their clients with a high quality of response. Opportunities, risk, and suggestions on use of QBS for procurement of architecture and engineering services. The collapse of contract giant Carillion shows the need to rethink how to procure and manage public sector contracts, says the Royal Institute of British Architects (RIBA). In a public statement, RIBA said the current system leads to a reliance on a small group of large companies, reducing the talent pool and concentrating risk in too few hands. The crash of Carillion, a company that also operated in Canada, has triggered scrutiny of the role of the private sector in public infrastructure – including public-private partnerships and outsourcing contracts for building and running public services. Here’s an article in the Architects’ Journal.